Alcohol (ethanol) and alcohol sanitizers have been used in hospitals and medical centres as alcohol is effective in sterilizing both skin and medical instruments. 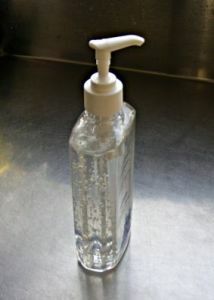 Recently alcohol-based hand sanitizers have become popular in the house. What Do The Sanitizers Do? Can Using These Harm My Skin? Can My Child Be Poisoned? These gels provide water free sanitization and are particularly useful in situations where clean water and soap is not readily available. The time taken to properly wash and dry hands can be too long for a child who is wanting to go and play again, so being able to rub hands dry while returning to play can be attractive. Alcohol sanitizers can kill many bacteria (though not all), viruses, and fungi from the skin. They do not provide appropriate levels of protection after working in food preparation. They are not useful if there has been contamination with dirt or chemicals. Most of the household products in Aotearoa/New Zealand have between 60 and 70% ethanol (alcohol). Some sanitizers can contain other ingredients that can also kill bacteria, making them more effective that those with alcohol alone. Using alcohol hand sanitizers can dry the skin so many manufacturers add ingredients to help keep the skin moist. However, simply using soap and water can also be drying on the skin. If a person using a sanitizer develops any skin problems they should stop using that product. Ingestion of the gel can lead to poisoning if sufficient was eaten. However, these gels usually do not taste particularly pleasant and so normally only a small amount is eaten. If a child drinks any hand sanitizer the child should be given something to eat and your local poisons centre should be contacted for further information. The specialist will be able to tell you whether any medical care is required and what symptoms to be aware of. Alcohol evaporates fairly quickly from the skin. It is important to continue to rub hands until dry to ensure that all of the alcohol has evaporated. If alcohol remains on the hand then there is a risk of eye irritation if the eye was rubbed.